Food & Wine is a responsive restaurant HTML template developed by Cr3ate, and featured on ThemeForest. The layout of the template is very modern. The homepage features a full width slider and a responsive carousel. Also you will have a full width banner slider with captions and links. Your homepage will have a lot of place for your content, and you will be able to present all of your finest dishes and catch the reader’s attention with your mouthwatering delicacies. Tease them by putting thumbnail photos of your dishes on your homepage, along with small text, and by clicking on “read more”, your visitors will be redirected to a full content page where you can bring the dish closer to them in detail, along with photos. The Food & Wine template allows you to display testimonials from your satisfied customers and have them slide across your homepage so everyone can see all the good things people have to say about your place. It features a fully functional reservation form so your customers can book a table right there on your website, with the possibility of adding important details such as the number of guests and with an option to write a message regarding the reservation. It is very easy to add display your opening hours on the homepage, and you can also add your Flickr gallery displayed in thumbnails. A fancy box gallery is also featured to make your website even more attractive. Social networking is very well covered, and integration with the most popular social networks is provided. Create a nicely categorized menu with descriptions and prices so your visitors can have a clear view of what you offer to them in your restaurant. The “contacts” section features Google Maps making sure everyone can easily find the exact location of your restaurant. This responsive HTML restaurant theme was created with HTML5 and CSS3, and it is very well documented and easy to edit with PSD files included. 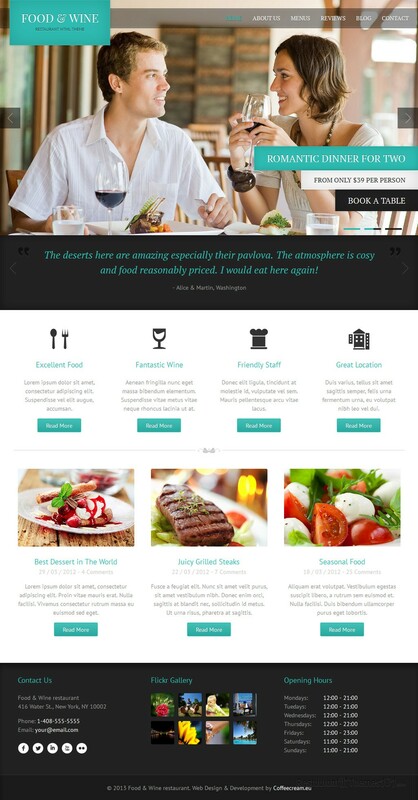 Besides this HTML version you can buy Food & Wine also as a WordPress restaurant theme.